Registration for our 2019 Annual Vendor Fair is NOW OPEN! Industry Partners must register for a table. Visit the Chapter Events Tab for more information and to complete your registration. The Georgia Department of Public Health (DPH) and the Centers for Disease Control and Prevention (CDC) have confirmed 17 cases of E. coli O103 infection in Georgia. Because this is an ongoing investigation, the number of cases is expected to increase. These illnesses are part of a multistate E. coli outbreak sickening nearly 100 people in five states. There are no reports of death in the outbreak. A specific food item, grocery store, or restaurant chain has not been identified as the source of these infections. DPH is interviewing the individuals who became ill, asking them about foods they ate in the week before they got sick and looking for any other exposures or commonalities. People usually get sick from E. coli O103 an average of 3-4 days after swallowing the germ. Symptoms of E. coli O103 include diarrhea (often bloody), severe stomach cramps and vomiting. Anyone experiencing these symptoms should see their doctor. Young children, the elderly and people with weakened immune systems are most at risk for developing complications from E. coli infection. To view the CDC alert, please click here. To view the new CDC resources, please click here. 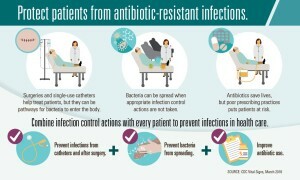 CDC releases new guidance and campaign to fight antibiotic resistant infections. To learn more about the new CDC resources, please visit the Infection Control Resources page or the CDC Website.